Santa Clara Vanguard spent six days in Auburn, Calif., for their daily rehearsals at Placer High School, which is nestled in the Sierra foothills. In return for the hospitality of the school and the surrounding residents, the corps hosted a free clinic that was attend by approximately 1,200 people this past weekend. The 90-minute clinic included an introduction into drum corps up close and personal time with individual sections, a demonstration of an SCV ensemble rehearsal. It was wrapped up with a run through of the corps' first three pieces. The feedback from the unexpectedly large crowd was fantastic. Many of the surrounding neighbors of the school attended, and expressed their appreciation of the hard work the corps members had been putting in all week -- even if meant a little extra noise in the neighborhood. Auburn was the corps first stop on the corps' 2003 tour, which started June 6. 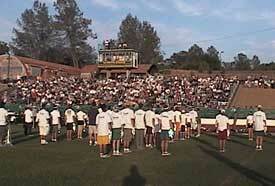 The corps is currently in Angels Camp, Calif., and will be putting on a performance Thursday, June 19, at 7 p.m. This performance is free and open to the public.